I finally have a breather. After three back to back parties, and a large cupcake order, I finally don’t have to rush to finish decor or check off a list. I took the rainy Monday to get some serious event organizing done; put away decor, send thank you’s, gather notes/invoices and put everything away in its rightful place. It also gave me a chance to redecorate and give new life to things I hadn’t before. It was a calm day, organizing is quite therapeutic for me, so I would take breaks to finally edit photos from all the events I’ve been working on. 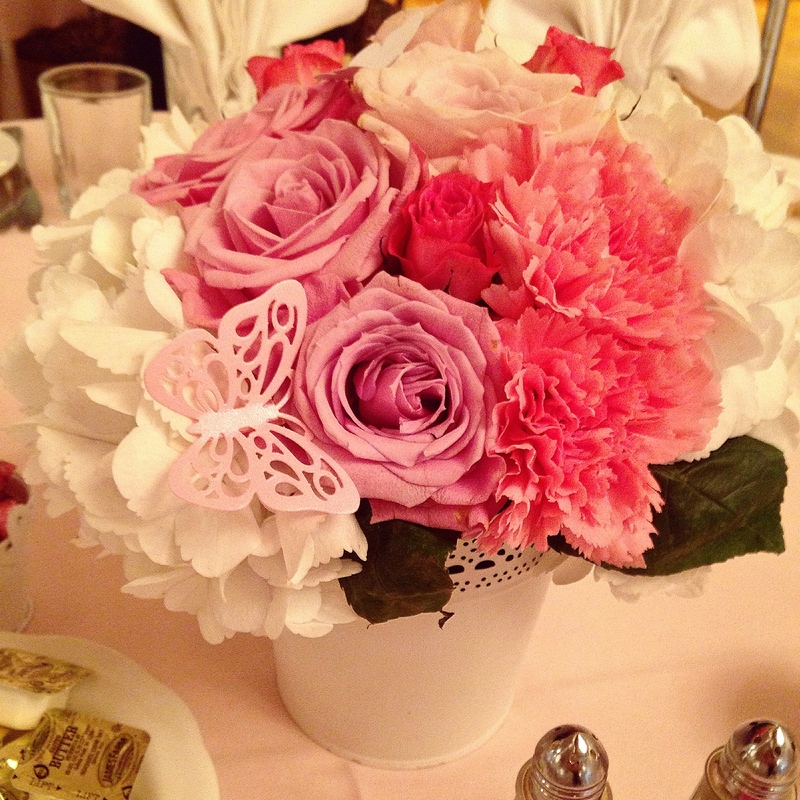 And today I’m sharing a pink butterfly garden baby shower I did the florals for. I first shared these florals with you when I created the mock-up for my clients. 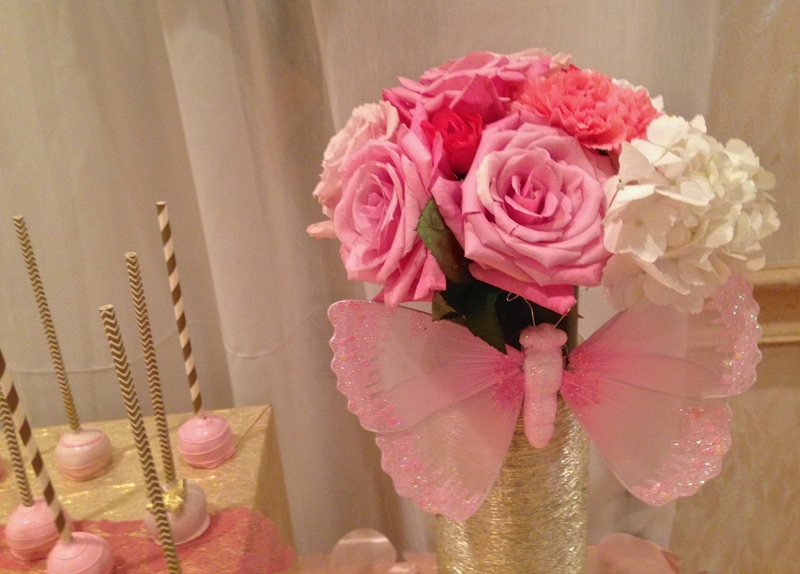 There were a few changes, that alongside the other beautiful crafted decor the hostesses and dessert table stylist, Susana, worked on, that made this ballroom baby shower a pink butterfly garden wonderland. 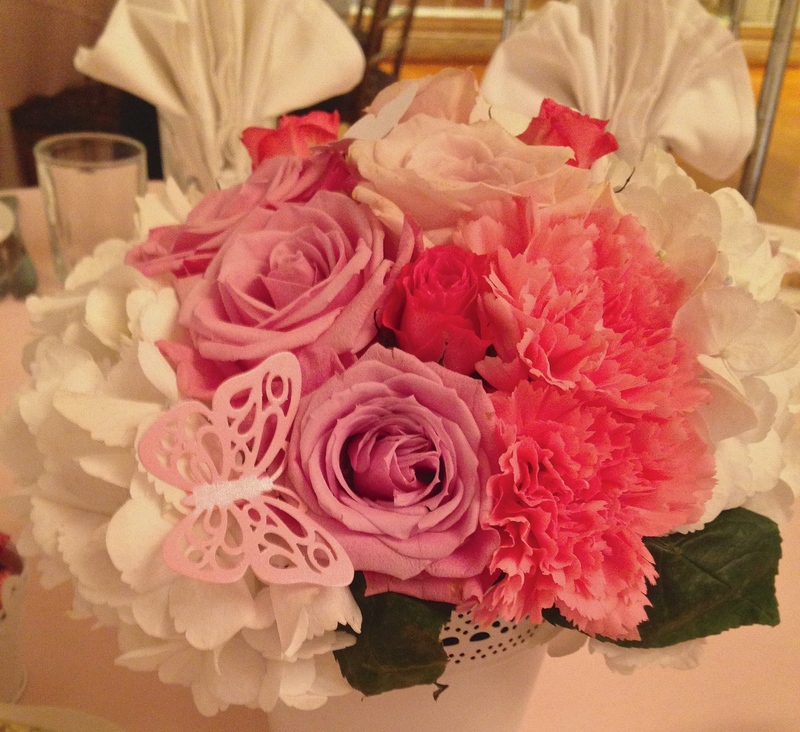 I created a ombre floral “N” for the arriving baby’s name, that was placed onto the seating arrangement table, as guests entered the ballroom. I wish I could share a how-to on this floral letter, although easy, making the box in the letter shape and lining it to prevent the water from oasis to ruin it, it became a much more time-consuming project than expected, but the result was definitely worth the effort. Follow this awesome DIY, it’s what helped me create this beauty. 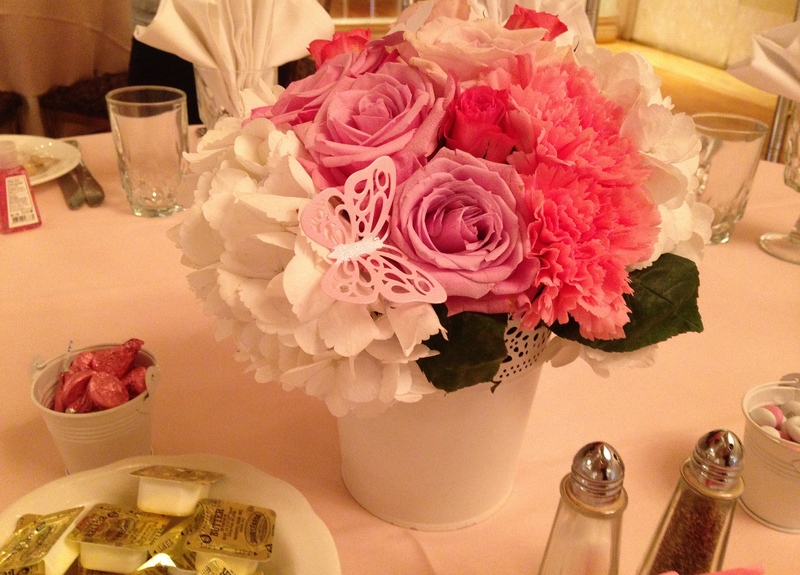 Paired with these florals were two white wire bird cages with clothes pinned table arrangements on both sides. There were also white wooden letters that guests could write well wishes for the baby, in pink of course. Didn’t the hostesses do such a great job with this, such a cute idea! Susana did such an amazing job making the desserts, and creating this pretty gilded pink butterfly garden dessert table. If you can see in the background, the hostesses placed pink hand sanitizer bottles at each place setting, while two mini white pails filled with candy were placed alongside the florals. 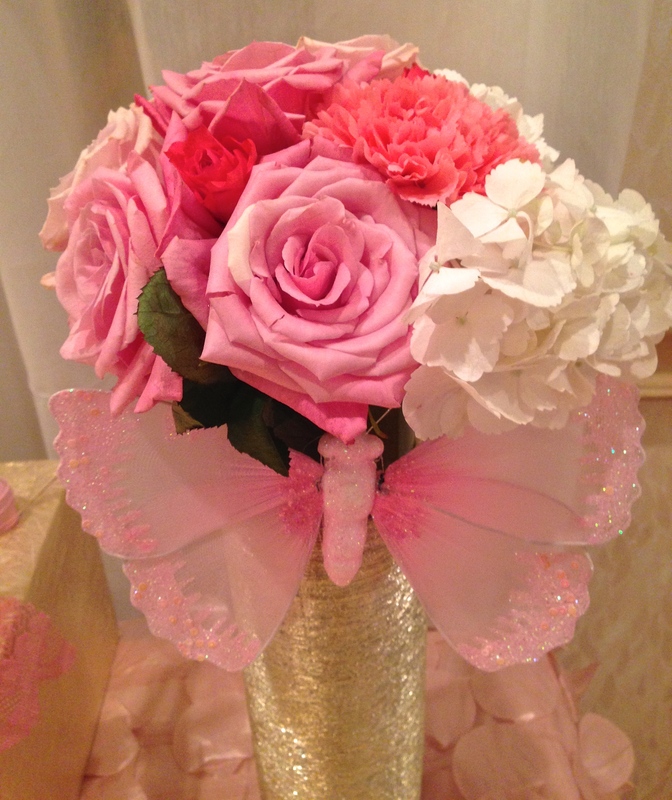 I added pretty pink and white paper butterflies onto all the floral arrangements. How adorable! The mommy and daddy-to-be loved everything, and had a wonderful time with family and friends. Wishing you all the best of luck as parents, and much health and happiness to the new baby girl.